Animal Endocrine Clinic: What's the Best Diet to Fed Dogs with Diabetes? What's the Best Diet to Fed Dogs with Diabetes? 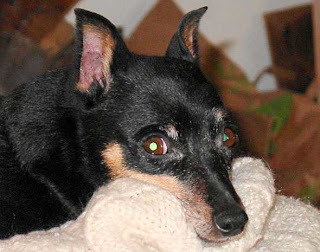 I'm writing about my dog Minnie, a 7-year old female spayed miniature pinscher (Min Pin). In November of 2012, she was diagnosed with diabetes and started on insulin (Humulin N; NPH insulin). She was very overweight when I adopted her (body weight of 26 pounds) and looked more like a football with legs. After being diagnosed as diabetic, my vet changed her diet to Hills Science Diet w/d. It really helped her lose weight, and now she looks like a Min Pin should look (current weight, 14 pounds). Despite her body condition normalizing, I am now very concerned about her current health. Her blood sugar levels generally range from 100-120 mg/dl on 7 units of NPH twice daily, but her thirst and urinations remain high. In addition to the polyuria, she now is showing signs of hair loss, muscle weakness, and thinning of the skin. Also, when I feed her, you would think it was her last meal. My thought was that it was from her diet but my vet insists that w/d has everything Minnie needs. The vet was concerned that she may have Cushing’s syndrome. We did a screening test for Cushing's syndrome (i.e. a low-dose dexamethasone suppression test), which came back today negative for Cushing’s disease. A test for thyroid function was also normal. I once again asked about the food, which my vet still believes isn’t the cause of her hunger and hair loss. My question is – Could there be something in W/D that Minnie is allergic to that could be causing some of the same symptoms? Or could it be that she isn’t getting the appropriate nutrition? I’m also wondering what would be another good dog food for diabetic dogs that she might respond to better? Anyway – thank you for taking the time to read this and I hope you could offer some good advice. It's very difficult to attribute all of your dog's clinical signs to the feeding of the Hill's w/d diet. That said, I would change Minnie's diet as the first step in her management. What's the best diet for canine diabetes? There is not one type of diet that is recommended for all dogs with diabetes. Diabetic dogs can do well when fed a number of diets as long as they are nutritionally complete and balanced, do not contain simple sugars, are fed at consistent times in consistent amounts, and are palatable to ensure a predictable and consistent appetite. As we all know, it's difficult enough to regulate a diabetic when they are eating consistently well— if they refuse to eat their diet, adequate glucose regulation can become next to impossible. With any diabetic dog, the most important dietary factor in the diabetic is consistency, so that you can match your insulin dose to the degree of postprandial (after feeding) hyperglycemia. The key to feeding diabetic dogs is to feed the same amount of the same diet at the same time every day! In diabetic dogs that are overweight or obese, I always recommend feeding a reduced calorie diet designed to help the dog lose weight. The high fiber diets (such as Hills w/d) are good for this purpose (1-4). So feeding Minnie the w/d when she was grossly obese was a very good idea. In underweight dogs with diabetes, however, the goal of dietary therapy is the complete opposite. In these thin dogs, our priority is to normalize body weight and restore and preserve muscle mass. These dogs may never regain the weight needed if a food with moderate to high amounts of fiber is fed — they may even continue to progressively lose even more weight. Therefore, these thin to emaciated dogs should be fed a high-quality, higher energy diet that can contain a slightly increased fat content to ensure that they regain their lost body weight (3-5). Recent studies fail to show a clear-cut clinical benefit of feeding a high-fiber diet over a typical adult maintenance diet with moderate-fiber content to diabetic dogs. In one study, no significant differences in insulin requirements or glycemic control were found in dogs fed a high-fiber, moderate-carbohydrate, moderate-fat diet versus an adult maintenance diet with moderate fiber, lower carbohydrate, and higher fat (5). As expected, weight loss occurred when the dogs were fed the high-fiber diet, whereas body weights were maintained with the moderate-fiber diet. Not all diabetic dogs should be automatically fed a high-fiber diet, such as Hills w/d. In your dog, a change in diet to one higher in calories would now be indicated, at least in my opinion. I do agree with your veterinarian that the signs of increased hunger, continued polyuria and polyuria (despite good control of the blood glucose values), hair loss, and thin skin all point to hyperadrenocorticism (Cushing's syndrome) (8). This is a common problem is middle-aged to older dogs, resulting from an excess production of cortisol from the adrenal glands. Secondary diabetes will develop in about 10% of dogs with Cushing's syndrome, and the diabetes is frequently difficult to control (8-10). The fact that a single test for Cushing's has been negative cannot completely rule out Cushing's syndrome (8,11). However, the fact that Minnie is showing signs of weight loss cannot be explained by Cushing's, a condition in which weight gain is more common (8-10). In any case, additional testing of adrenal function should be considered, especially if a diet change hasn't caused a marked improvement within a month or two. Dogs should never be fed a high-fiber diet just because they have diabetes. Such high-fiber diets are contraindicated in thin or emaciated dogs with diabetes, as well as normal weight dogs that are undergoing unwanted weight loss (5). Many diabetic dogs do better on maintenance diets containing lower amounts of fiber and carbohydrate and higher amounts of protein. A consistent diet —that is, the type, amount, and time of feeding —is generally much more important in diabetic regulation than any particular fiber content or specific type of diet. Other than that, we want to feed any diabetic dog a diet that will maintain normal body weight. Nelson R, Duesberg C, Ford S, et al. Effect of dietary insoluble fiber on control of glycemia in dogs with naturally acquired diabetes mellitus. J Am Vet Med Assoc 1998;212:380–386. Graham PA, Maskell E, Rawlings L. Influence of a high fibre diet on glycaemic control and quality of life in dogs with diabetes mellitus. J Small Anim Pract 2002;43:67–73. Rucinsky R, Cook A, Haley S, et al. American Animal Hospital Association. AAHA diabetes management guidelines. J Am Anim Hosp Assoc 2010; 46:215-224. Zicker SC, Nelson RW, Kirk CA, et al. Endocrine Disorders. In: Hand MS, Thatcher CD, Remillard RL, Roudebush R, Novotny, BJ (eds), Small Animal Clinical Nutrition. Mark Morris Institute. 2010; 559-584. Fleeman LM, Rand JS, Markwell PJ. Lack of advantage of high-fibre, moderate-carbohydrate diets in dogs with stabilised diabetes. J Small Anim Pract 2009;50:604-614. Elliott KF, Rand JS, Fleeman LM, et al. A diet lower in digestible carbohydrate results in lower postprandial glucose concentrations compared with a traditional canine diabetes diet and an adult maintenance diet in healthy dogs. Res Vet Sci 2011;96; 288-95. Melián CM, Pérez-Alenza D, Peterson ME. Hyperadrenocorticism in dogs In: Ettinger SJ, Feldman EC, eds. Textbook of Veterinary Internal Medicine: Diseases of the Dog and Cat. Seventh ed. Philadelphia: Saunders Elsevier, 2010;1816-1840. Peterson ME, Nesbitt GH, Schaer M. Diagnosis and management of concurrent diabetes mellitus and hyperadrenocorticism in thirty dogs. J Am Vet Med Assoc 1981;178:66-69. Eigenmann JE, Peterson ME. Diabetes mellitus associated with other endocrine disorders. Vet Clin North Am Small Anim Pract 1984;14:837-858. Peterson ME. Diagnosis of hyperadrenocorticism in dogs. Clin Tech Small Anim Pract 2007;22:2-11. Perhaps elevations of other hormones, atypical Cushing's disease? I appreciate the support for many diets working well for diabetic dogs. That is our experience at the canine diabetes forum. Can you give an example of the "higher quality, higher energy diet.....? such as what is an example of the "typical adult maintenance w/moderate fiber content? My Boston, Louie has diabetes, and is very thin now after being on Science Diet W/D. He was overweight at 33 lbs, but now at 23 he is too thin. Could you give an example of the "high quality, higher energy diet...." or the typical adult maintenance with moderate fiber content. My Boston Terrier Louie is diabetic. He is on Science Diet W/D. He started at 33 lbs, but is down to 23 and too thin!! I now feed him 3/4 cup W/D, 2 tbls ground chicken, tbls can food (low fat pedigree) and spoon ful cottage cheese. His afternoon meal consists of 1 cup W/d, 1/2 cup ground chicken/green beans, 2 tbls can food and cottage cheese. He is maintaining, but I think he needs to gain some. Blood glucose runs from 144 (late afternoon) to 390 usually at night. Early fasting is around 280. Our 1/2 Pug 1/2 MinPin was diagnosed with diabetes on October 21, 2014. She is on 2 shots of insulin every day and our Vet recommended feeding her Science Diet. We did that for 2 weeks and had her sugar checked and with this food it went up 200 points. We now feed her Blue Wilderness and her sugar went down 100 points in 2 weeks and are taking her back to get it checked this week. I did find out that Vets recomment Science Diet because that company runs a Vet School....so to me it's a I scratch your back you scratch mine. I do not recomment Science Diet to any dog that is diabetic.